Brick workers are among the most exploited and marginalized of unskilled laborers in Nepal, with a workforce of nearly 200,000 people that includes an estimated 32,000 children. These vulnerable people are bonded by debt and subject to harsh living and working conditions. 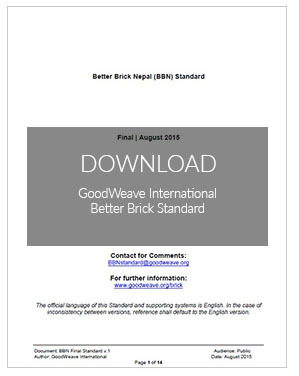 In response to this, Better Brick — Nepal was launched in 2013, representing an opportunity for GoodWeave to team up with local and international experts and replicate its proven model in another industry. Today, the program is working to eliminate child, forced and bonded labor in brick kilns through an incentive-based system linked to market demand for ethically produced bricks. Kiln owners who agree to the strict Better Brick Standard receive assistance that can improve their efficiency, motivating them to do the right thing and adhere to the standard’s meaningful principles on child labor, forced and bonded labor, wages, working conditions, and humane treatment. The program is raising awareness of the issue and advocating for change, while also addressing underlying factors that drive worker exploitation. Kilns that have joined the program have achieved, or are working towards, child-labor-free status. GoodWeave and its partners are working to refine the program to ensure an effective model that will eliminate child, forced, and bonded labor in brick kilns in Nepal. Better Brick Nepal is a collaboration of Nepali NGOs, progressive brick kilns, the Government of Nepal, Global Fairness Initiative and GoodWeave, and is supported by Humanity United.